At each process step, Document Maps show us what documents to produce, and which to receive. Information defines your business, representing not only your organization’s past experience, but also its future potential. Your usage of technology to manage your information could be a source of strategic advantage. But information is not enough. You need knowledge and wisdom to build an organization. Today’s IT departments and resources are required to handle enormous amounts of data. This is where some degree of standardization can help minimize inconsistencies, confusions and resulting risks. But all data is not equal in terms of importance or sensitivity. Data itself is not very useful. Think of it as the “Know-nothing” stage. We must understand what the data is and how it relates to our needs. Once a relationship has been defined then the data becomes information. This is the “Know-what” stage. 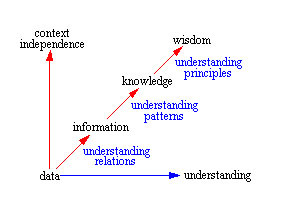 Next, the information must be converted into knowledge by finding patterns within the relationships. These patterns have the potential to represent knowledge once the patterns and their implications are understood. Knowledge allows us to predict, information by itself, does not. This is the “Know-how” stage. Wisdom arises when the knowledge is transformed into insight or principles. In other words, once you understand the source of the patterns, you have found an eternal truth. This is the “Know-why” stage. Policies and procedures are written for a host of reasons including decreasing training time, meeting compliance requirements, communicating effectiveness measures, simplifying access to information and transferring knowledge. Use of consistent, well defined policies and procedures save time by guiding users in converting raw data into meaningful information, transferring knowledge, and imparting the wisdom from past generations in order to take appropriate actions in not-so-obvious situations. Having formal Computer & IT Policies and Procedures in place enables organizations to assign responsibilities and provides definitions, guidelines and rules for employees. Your IT policies and procedures should cover all aspects of your information technology management—from computer usage and network security to IT asset management and training & support. Policies and procedures allow managers to communicate the way things should be done and IT policies and procedures are no exception. Prewritten documents can speed up procedures development, which, in turn, speeds an IT department’s path towards greater effectiveness, and better results. To learn more about improving and strengthening your IT processes, order the Computer & IT Policies and Procedures Manual. If you are eager to learn more about creating more order out of the chaos you are feeling at work then check out our upcoming classes. How Is Information Technology Changing Business? What Is the Information Technology Infrastructure Library? Do You Have a Lean Competitive Advantage?